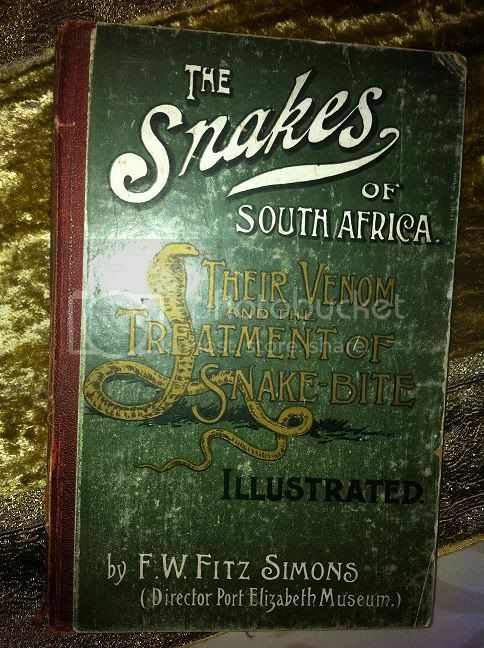 " A filed Guide To Snakes Of Southern Africa - V. F.M Fitz Simons"
It Has Black And White Photographs and Colour drawings/prints in it. Also covered in a brown cloth/binding. I'll pay u 450 for Fitzsimons' Snakes Of Southern Africa. There is a signed copy at TVL Museum. I wouldnt mind owning that copy. R20 000 perhaps? That belongs in a glass cupboard Deon, ancient! If you guys are really keen on older books a good idea is to keep an eye on charity book shops. I picked up several at our charity book shop for under ten rand each. Our South African Birds edited by Dr Austin Roberts, not dated but the forward was written in 1941. All illustrations are old tobacco cards- R2. "A field without a snake is like a kiss without a squeeze"
Hi guys not looking to sell, just was wondering what the value of such books besides been a welcome addition to our bookshelf.